This year, December's Beer Calendar in the Philadelphia Region is not planning to take a back seat to any other month of the year. With a festive calendar of events planned, I'll post a little preview of each week's events. With at least an equally long list of social events and to-do lists, you'll want to make sure that you take in at least one or two events during the month...y'know...just to keep a good life balance...and low stress...or whatever other excuses you might need to employ to avoid unpleasant tasks or obligations ;-) Here goes...week one...December 1st-December 7th 2008 You've got some tasting events to get you through the week at various locations around the region. Check out the following, for example: ~ A couple of Victory tastings include one on Fri. 12/5 - Keep the Pint Night @Les Bons Temps and one on Wed. 12/3 Meet the Brewer Night @Spinnerstown Hotel ~ On Thu. 12/4 in Old City's Triumph is a special Brewer's Reserve Barrel Tappings of Jewish Rye (beer, that is) ~ And, also on Thu. 12/4, Harpoon Brewery Promo Night @Isaac Newton's As far as Repeal Day (aka The End of Prohibition) goes, I could only turn up one event and it looks like a great one. Leave work a bit early and check out: ~ Repeal Day Celebration on Fri. 12/5 @Memphis Taproom A handful of special events and dinners look worth checking out. They include: ~ Tue. 12/2 gets the week started with Ho Ho Holiday Brews with Don Russell (aka Joe Sixpack) @Tria Café ~ same night, Tue. 12/2, on the north side of center city, check out the collaborative dinner between The Institute, Root, and Sierra Nevada. ~ Fri. 12/5 - Mad Elf Night @Grey Lodge with an '07 version, '08 version, and some married version of a guy named Nick Johnson ~ Sat. 12/6 - Release Party for highly sought-after Bottled Lambics @Iron Hill ~ And a charitable festival also on 12/6, Winter Beer Festival @The Cliveden But, lucky me. One of the week's (month's?) absolute highlights looks to be just out my front door. Car service, please? ~ Sat. 12/6 - 5th Anniversary Party @TJs For the full December list, you know where to go. It's no secret that I enjoy an active lifestyle....active in outdoor exploits like running, biking, and hiking just to name a few. Active also in my pursuit of well-crafted beer. Many wonder if these should be mutually exclusive, as in you can be a beer drinker or a runner, but not both. I agree with one word in that sentence, the word "NOT." The regular of you readers out there can attest that I remind you (sometimes probably painfully so) that moderate consumption of great beer goes perfectly well with an active lifestyle. You could even say that they complement each other quite well. And, now, the online version of Draft Magazine has carried on with this theme with a new section called Beer Runner. Though, I've got to wonder why they didn't ask me to play host for it. Ah well, perhaps I'll get a call for an interview of me and my perspective one day soon. Check it out; they've already got some good interviews and other material up for you reading pleasure. They've got another relatively new section as well that examines the intersection of Sports & Beer. It's all part of a widening focus that Draft Magazine appears to be taking. This, paired with well-rounded coverage of the beer industry (as a whole, not necessarily just "craft") is making for a decent beer publication that's maturing quite nicely. If you haven't checked them out in a while, you might just want to do so again soon. Mr. Sixpack is right on the money today with his plan of attack for dealing with Black Friday Madness. If you're in the western suburbs of Philly today, around, say, the Plymouth Meeting or King of Prussia Malls, do yourself a favor and get as far away as soon as possible and over to Capone's on Germantown Pike. The taps are now flowing! Session-ists need not attend. I could get into a bunch of superlatives here regarding this tap list, or I could shut up and just let you get to your drooling over this list. Sheesh, where to begin??? After gutting my way through the last mile and a half of the Philadelphia Marathon on Sunday, Patty and I met up with friends at The Tiedhouse where we had a table for nine. The Abbey Blonde was my first beer of choice, followed by a Bière de Framboises. With a Brewmaster's Breakfast Bowl and beer under my belt, I started to bonk. (Though, I don't think I bonked nearly as badly as did the Eagles...but that is a topic that shan't be discussed here.) Aches and pains from Sunday's marathon have subsided, but since then I've contracted a nasty cold. Apparently, and understandably, the body's immune system takes a beating during such a physical exertion so it's no surprise that I'm at the greatest risk for getting sick in the days immediately following the race. I should be back in the swing of things by this weekend. The time between the Thanksgiving and New Year's holidays will be a great time for beer here in the Philadelphia region. It begins with a dinner at The Farmhouse in Emmaus, a Stout event at Union Jack's, and an Open House at Philadelphia Brewing this coming weekend. Enjoy what will, for many of you, be a "long weekend." Here are a few more pictures related to the Marathon. Signs of support from friends and family Part of my "recovery plan." 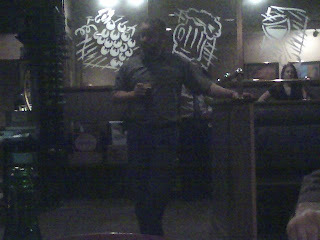 Here's an attempt to bring together most of the first-hand accounts of GABF 2008 that I've come across. If you know of others that should be included, feel free to drop me a line with a link. ~Steph, another Philly-based beer enthusiast has multi-part content that traces some of the same path that Patty and I did through Colorado. Start with this link over at her site. ~Chipper Dave has a fascinating behind-the-scenes look at volunteering at GABF. ~Lew brought home a new wall hanging for his writing skills and has a bit to say about it at his blog. ~Tomme always has something interesting to say on his brewer blog. After drying out back at home, he shares some of this thoughts of GABF 2008. ~Jenny Talley, award-winning brewer at Squatters in Utah, has a few words as well. ~Dr. Joel of New Holland worked the festival, the town, and the networking like a man on a mission and shares a few of his thoughts on his blog. I, myself, had 15 separate postings (actually, this makes 16) about this year's GABF. I won't link directly here to each posting; but, you could start with a full directory of all of them. Then, you can pick and choose from them at your reading leisure. I know many of you like the pictures, so here are some direct links to Picasa photo albums. The Worst Brew Lounge Effort Ever. Cut right to the chase, I forgot my camera. This sort of thing bothers me. Mostly because as much as I'm sure that you read and hang on every word (ha! ), I know that some of you stop by just for the pictures. Well, maybe I can make up for it with my well-manicured prose and that this time you really will read just for the words. This was actually my first sit-down beer dinner ever at The Drafting Room, in Exton, PA...and I sense that it will be the beginning of a new trend. I've been to plenty of beer events at TDR, just never any of the sit-down dinner variety. This dinner was pulled of quite nicely. Four courses, four beers (actually six), 60 people, in two hours. It doesn't hurt that Sierra Nevada's representative, Patrick Mullin, can work a crowd with the greatest of ease. After casually being served our Southern Hemisphere welcome beer along with the bite-size appetizers, the mingling in the main dining room came to an end and everyone settled into their seats. The grilled St. Andre cheese with blueberries was served next along with the Chico Estate Harvest IPA (one of three kegs in Pennsylvania, if I heard correctly). This beer, tough call, but I'd say was my favorite of the evening. There was a unique earthy flavor that I never got around to discussing with Patrick. That's when Patrick introduced himself to the packed room and got started on the history of Sierra Nevada and even wandered down the history of beer road all the way back to Pliny the Elder himself. It took all of about 30 seconds for Patrick to have the crowd toasting, laughing, and applauding. Which reminds me...the last sit-down, "lectured" event that Patty and I attended was a wine tasting at Morton's. Lovely wine and all. But, the stuffy crowd? bleh. Last night at TDR, tables for six and eight patrons were scattered around the room, ensuring that strangers were bound to sit together, just as at our wine-tasting event at Morton's. The biggest difference was that at TDR, the attendees genuinely and outwardly appeared to be enjoying themselves. I have little doubt that the winos were enjoying themselves as well, but it just seems that they've been trained to not effusively show it. It took going with two others from Morton's to Monk's Café to find out that they had some real personality. Okay, enough wine-bashing for today. (And, this is coming from someone who really, really enjoys wine....but, let's save the rest of that conversation for another day.) Back to beer...Then, we hit the jackpot. Three years of Harvest Ale (aka Yakima) were presented to us with the lamb entrée. Not three, or five, or 6 ounces...but, ten ounces each. Yikes. Any sign of palate fatigue from twenty ounces of hops assault that wasn't already being experienced was sure to set in after this course, right? Well, sort of. Sixty ounces of hop perfection was the total tally of hops intake by the end of the evening, but remember that this was certain to be a night of hops education. 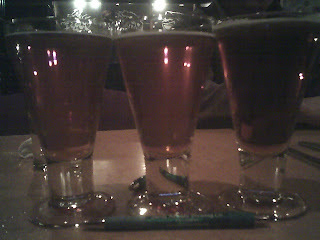 Tasting the Southern Hemisphere next to the Chico(s) and next to the three vintages of Wet Harvest ales (2006, 2007, and 2008) was a study in different levels of spicy, citrusy, piney, and earthy aromas and flavors. For the record, at least in my book, the 2006 was the most balanced fresh hop treat, the 2008 gave the biggest hop punch, and the 2007 left the smallest impression on me. Of course, I'd be remiss if I didn't mention the dessert. Yes, we can put this in the books as a successful beer dinner because it passed the final test...the last course of the night. The bread pudding was just as you'd expect it should be. Delicately doughy and tantalizingly sweet. Ordinarily, I may not have wished to pair this with an IPA, but on this night with Sierra Nevada in the house, it just seemed right. All of these beers were pouring from 1/2 barrels, so you should still be able to find them at The Drafting Room for at least a short bit longer. Kudos to the front of the house service (table staff as well as bar staff led by Heather Higgins and Sean MeGettigan) and the kitchen staff led by Chef Theo Charitos; they sold me on their beer dinners (not that I'm surprised) and I'll be sure to return for the next one. Don't forget, you don't need to RSVP. Just show up at the General Lafayette tomorrow morning between 9:30-10:00 for a 10:15 departure. Again, this is not a race and runners and cyclists alike are welcome to join in for this autumn roll down the Wissahickon and Schuylkill. RAIN OR SHINE! If you'd like a sneak peek at our scenic route that we'll be taking, check it out over here. Come join Chris Leonard of General Lafayette and me on a 13.1 mile run from Lafayette Hill to Philadelphia's home of the new Tiedhouse. He and I could both use a lift as we come down the homestretch of preparation for the Philadelphia Marathon on 11/23. Run it or Bike it. It's one of the most beautiful routes through the Philly region into the heart of the city with...wait for it...beer and brunch awaiting us at the end...here's the tap list as of earlier this week. The official details follow below. It may be short notice, but you've gotta get outside for some exercise anyways, right? !